Since the Samsung HT-H7730W 7.1 Smart Home Theater System is very parallel in performance and specifications to the earlier model, HT-F9730W, I'm keeping this review of the HT-H7730W short and sweet. Rather than repeat all their similarities here, you should simply click on this link to the previous review of the HT-F9730W from April. For this abbreviated article, I will describe the few differences in the systems. But first, both are complete home theater audio systems, which include a 3D Blu-ray player combined in one unit with an AV receiver that powers seven surround speakers + a subwoofer. Even though you can aim up the Front Height speaker, this is not a new Dolby Atmos system. With that said, both the HT-F9730W and the HT-H7730W produce excellent audio that would be a definite improvement over the sound emanating from the speakers integrated into most HDTVs. Add in all of the Smart TV features that Samsung supplies like Internet content providers and a chest full of apps that can be tapped wirelessly and the HT-H7730W - like its predecessor - offers a complete home theater package. As mentioned, the specifications of the two systems are almost identical. Three differences are apparent and relevant when deciding which you may purchase. 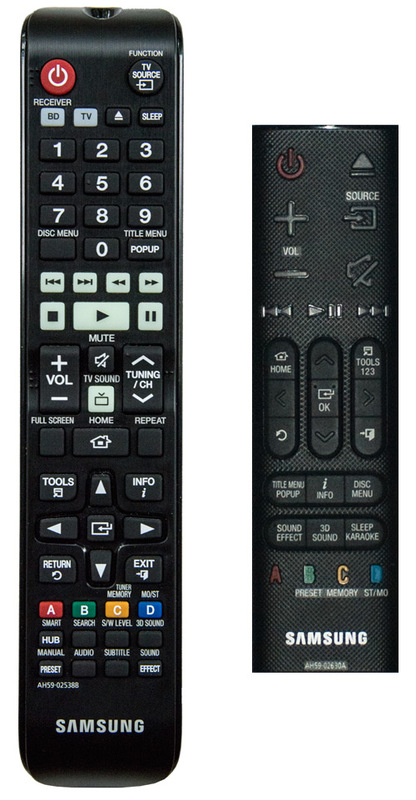 Not only are there fewer buttons on the HT-H7730W remote, the unit's smaller size makes the buttons harder to navigate. For example, the Left and Right arrow functions are sandwiched between two other buttons. And then there's the odd icon for the Mute button. Also, on the back of the HT-F9730W remote is an NFC (Near Field Communication) tag where you can tap your NFC enabled smartphone to pair it with the HT-F9730W. The HT-H7730W remote does not include an NFC tag. Simply, the HT-F9730W remote makes the system notably easier to use. The second difference may not be as essential for everyday use, but it helps when setting up the system's speakers. 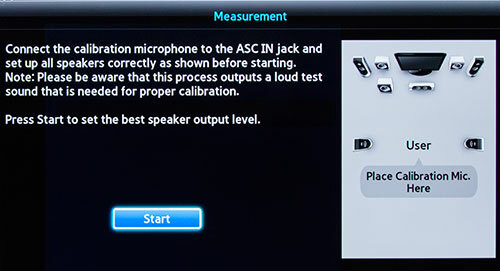 The HT-F9730W supplies an audio calibration program, which includes a microphone. The on-screen instructions are simple. The process will sense where you have placed the speakers and balance their output accordingly. The HT-H7730W does not offer the audio calibration program, nor the microphone. You and your ears are on your own for balancing the output of the seven speakers + subwoofer. I find the calibration option much more efficient. Both the HT-H7730W and the HT-F9730W have a test tone procedure for adjusting speakers. The newer HT-H7730W takes the process a step further with the Sound Customizer that "lets you calibrate the home theater for the optimal sound quality based on your hearing level and the ambient conditions." You can customize three Sound Profiles that you can select as well as a preset Hearing Impaired profile. I'm not finding this Sound Profile feature on the HT-F9730W. Finally, the suggested retail price of the older HT-F9730W is $999. The HT-H7730W is $949. But the street prices are a moving target. Right now, on their website, Samsung is listing both systems on sale for $799. I would almost pay the extra $50 SRP for the bigger HT-F9730W remote control. If the street prices are the same, picking the HT-F9730W would be a no-brainer for me. Of course, if the customizeable Sound Profiles appeal to you, then go with the HT-H7730W. To reiterate, the specifications and performance of both systems are very similar. 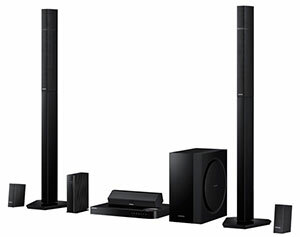 Please read my earlier review of the HT-F9730W for detailed descriptions of features that also apply to the HT-H7730W. The Samsung HT-H7730W offers a complete 7.1 1330W home audio system in one coordinated package that includes a 3D Blu-ray player/AV receiver hybrid unit. With its excellent audio quality and a long list of Internet content providers, the bundle would make a great upgrade to an older non-Smart HDTV.